Southampton manager Ronald Koeman has ruptured his Achilles tendon on the eve of the new Premier League season. The Dutchman, 52, suffered the injury during training and is a fitness doubt for the Saints' Premier League opener against Newcastle on Sunday. 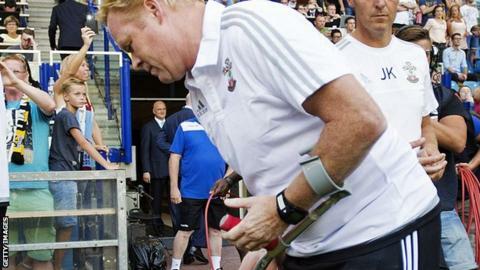 Koeman took his place in the dug-out - albeit with crutches - for Thursday's Europa League win at Vitesse Arnhem. They have been drawn against FC Midtjylland in the play-off round. "He knows he has already some problems with his Achilles," Koeman's assistant and brother Erwin Koeman said. "He has gone to hospital and they will decide what to do." Fortunately for Southampton, Koeman is the club's only injury concern ahead of the weekend trip to St James' Park.